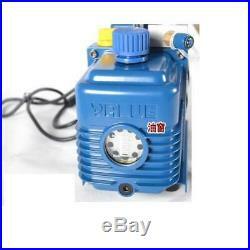 Vacuum Pump Refrigerant Air Conditioning Repair Fiber Model 250W Solenoid Valve. 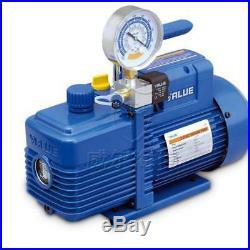 2L vacuum pump V-i140SV new refrigerant R410A air conditioning repair fiber model 2Pa 250W 7.2m3 / h with a solenoid valve. 1, high ultimate vacuum, high pumping speed design: two-stage rotary vane design improves the ultimate vacuum and pumping speed reduces the exhaust time of the pump. 2, the unique structural design of the pump: pump parts with the overall design, while using a cylindrical pin connection between the body, improve product reliability and ease of maintenance of the pump. 3, forced oil inlet design: with internal vacuum pump, which can produce a constant pressure of the oil supplied to the pump chamber and the slide shaft. Suitable for R410A, R407C, R134A, R22 and other refrigerants. 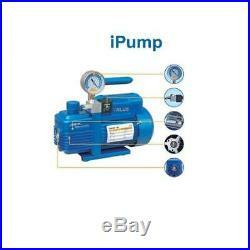 Single-stage vacuum pump new refrigerant. Rated voltage 220V / 50Hz. Pumping rate 7.2m3 / h. The amount of fuel 50ml. Air inlet connection thread 7/16 -20UNF. Overflew series of single, two-stage rotary vane vacuum pump is used to seal the gas container extraction basic vacuum obtain equipment. 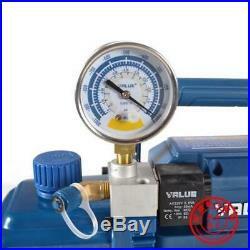 Suitable for refrigeration servicing refrigerants including CFC, HCFC and HFC, such as R12 / R22 / R134A, etc. The new refrigerants including R410A, R407C, printing machinery, vacuum packaging, gas analysis, thermoforming industry pumping operations, but also various types of equipment can be used as a high vacuum pump before use. 3, forced oil inlet design: with internal vacuum pump, which can produce a constant pressure of the oil supplied to the pump chamber and plain bearings, to ensure they are in good state of lubrication and sealing, and giant windows, low oil level design, more conducive to the use of the product. 4, anti-back oil structural design: the intake port install high quality solenoid valve and vacuum table, when the pointer to the zero position, taking the job is completed, the system automatically cut off after being drawn off; can effectively prevent vacuum pump oil into the container to be working, the working container within a certain period of time to maintain the vacuum state, and to protect the cleaning container. 5, gas ballast design: when the vacuum pump, the gas ballast valve into the amount of non-condensable gas to dust compression chamber to reduce the gas is pumped condensable vapor condensation level in the pump. 6, long-lasting filter design: the intake filter can effectively prevent foreign matter into the pump chamber, complement can effectively separate the oil mist from the exhaust. 7, solid and comfortable handle: modeling light chic metal handle for pump access, and to ensure reliable operation in use, high-quality rubber sheath on the handle can remain at room temperature. 8, good choice of materials: aluminum die-casting tank, frame, pump motor shell weight, metal bottom plate to make products more reliable seal, ring seals and other special material, resistant to all refrigerants. 9, motor protection: built-in motor protection, make the machine run more secure, reliable. The item “Vacuum Pump Refrigerant Air Conditioning Repair Fiber Model 250W Solenoid Valve” is in sale since Monday, July 16, 2018. 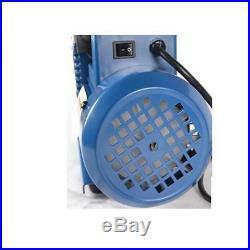 This item is in the category “Business & Industrial\HVAC\HVAC Tools\Other HVAC Tools”. The seller is “supertrademarketing” and is located in Hong Kong. This item can be shipped worldwide.